This house was built in 1841 for Clark and Harriet Greenman. Clark was the second oldest of the three brothers who founded the George Greenman & Co. Shipyard. It was built in the Greek Revival style then prevalent in the U.S. The cast-iron fence was put up about 1866, and the porches and ornate decorations were added to the house in the 1870s. The Clark Greenman House was further altered in the 1900s, but it is now painted to match its color scheme in the 1870s. It was acquired by the Museum in 1949 and served as the library before conversion to its present use as the Museum’s administration building. 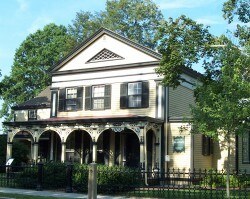 The Clark Greenman house can be seen from Greenmanville Avenue, between the Museum’s North and South entrances. The house is not open to Museum visitors.